The Aquificales are thermophilic microorganisms that inhabit hydrothermal systems world- wide and are considered one of the earliest lineages of the domain Bacteria. We analyzed metagenome sequence obtained from six thermal “filamentous streamer” communities (∼40 Mbp per site), which targeted three different groups of Aquificales found in Yellow- stone National Park (YNP). Unassembled metagenome sequence and PCR-amplified 16S rRNA gene libraries revealed that acidic, sulfidic sites were dominated by Hydrogenobac- ulum (Aquificaceae) populations, whereas the circum-neutral pH (6.5–7.8) sites containing dissolved sulfide were dominated by Sulfurihydrogenibium spp. (Hydrogenothermaceae). Thermocrinis (Aquificaceae) populations were found primarily in the circum-neutral sites with undetectable sulfide, and to a lesser extent in one sulfidic system at pH 8. Phyloge- netic analysis of assembled sequence containing 16S rRNA genes as well as conserved protein-encoding genes revealed that the composition and function of these communi- ties varied across geochemical conditions. Each Aquificales lineage contained genes for CO2 fixation by the reverse-TCA cycle, but only the Sulfurihydrogenibium populations per- form citrate cleavage using ATP citrate lyase (Acl). The Aquificaceae populations use an alternative pathway catalyzed by two separate enzymes, citryl-CoA synthetase (Ccs), and citryl-CoA lyase (Ccl). All three Aquificales lineages contained evidence of aerobic respira- tion, albeit due to completely different types of heme Cu oxidases (subunit I) involved in oxygen reduction. The distribution of Aquificales populations and differences among func- tional genes involved in energy generation and electron transport is consistent with the hypothesis that geochemical parameters (e.g., pH, sulfide, H2, O2) have resulted in niche specialization among members of the Aquificales. Takacs-Vesbach, C., Inskeep, W. P., Jay, Z. J., Herrgard, M. J., Rusch, D. B., Tringe, S. G., ... & Xie, G. (2013). 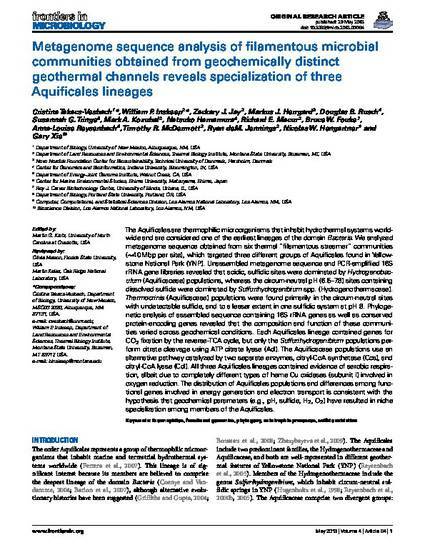 Metagenome sequence analysis of filamentous microbial communities obtained from geochemically distinct geothermal channels reveals specialization of three Aquificales lineages. Frontiers in microbiology, 4.